One of the best producers of any garden seems top be the zucchini. The plant is often called bullet-proof, immune to the machinations of even the most ham-fisted and black-thumbed gardener. 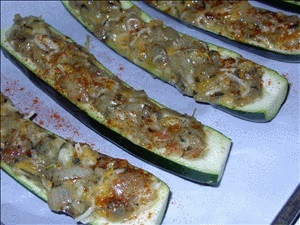 As a result, the end of the growing season is filled with zucchini and you can only wonder what to do with them. Well, since you grew them, you eat them. The trick is just to find ways to make them palatably different. This recipe make a delicious and festive vegetable your family will request again and again. It also works with Cheddar cheese (toss in a bit of chopped tomato), or your favorite cheeses, or any of the cheese blends that are popular in the supermarkets these days. Trim blossom and vine end of zucchini. Cut in half lengthwise. Use teaspoon, grapefruit spoon or melon baller to scoop out inside of the zucchini - trace edge of seeds and membrane with shallow cut. User tip of spoon to lift out larger pieces. Then scrape with point of spoon to finish the cavity. Leave a 1/4- to 1/2-inch wall so the squash will be strong enough to stuff. 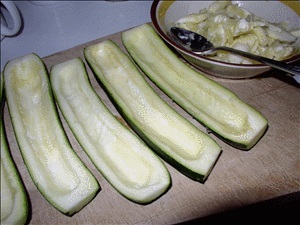 Finely chop the removed zucchini. In a frying pan, stir fry the chopped zucchini and onions in butter until onions are soft. Add flour, garlic and green chiles. Stir fry and additional 1 to 2 minutes or until heated through. Remove from heat. Add parsley, oregano, salt and pepper. Taste and adjust seasonings. Add eggs and cheese, stir just until well combined. 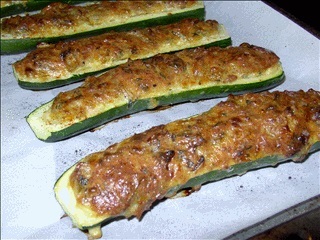 Place filled zucchini on a cookie sheet and bake in a preheated 375°F oven for 30 minutes or until eggs are set and zucchini shell soft. Tent with foil if the cheese gets too brown. Remove form oven and sprinkle with a bit more of the Colby Monterey Jack cheese.